You heard it here first: China has surpassed Japan and is now the world’s biggest film territory outside the United States, as measured by total box office revenue. For the past several months China has handily beaten Japan’s national box office take, and the gap is widening as China’s torrid pace of revenue growth continues. Although China’s annual total of $2.05 billion for 2011 fell slightly behind Japan’s $2.29 billion, the last few months of 2011 and January of 2012 saw China surge ahead. 2012 will undoubtedly be the year in which China solidifies its position as the world’s number 2 market behind the United States. Now it is just a matter of time—about 6-7 years if current trends continue—before China overtakes the United States to permanently become the world’s biggest and perhaps most important movie territory. For Japan, the lingering effects of the 8.9 magnitude earthquake and tsunami that devastated the country last March have certainly been a factor in its descent to #3. Hobbled by the damage to northeastern Japan’s infrastructure, and by a dampened national mood, box office dropped by 10 percent (nearly 18 percent in local Yen currency) from the record-breaking tally of $2.66 billion in 2010. But even had there been no earthquake, Japan would have inevitably yielded the number two spot to China by 2013. Japan, like the U.S., has been a mature market for some time; even if we dismiss 2011 as an aberration, the annualized box office growth rate there has been in the low single digits for years. China, by contrast, has been growing by nearly 40 percent per year for a decade. 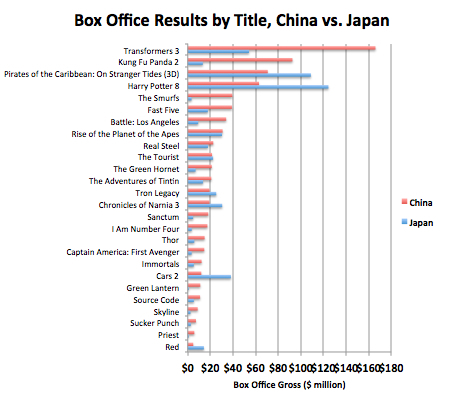 And aside from total box office, China outperforms Japan in other key measures. As a market for Hollywood films, China has the clear edge over Japan. Of the 26 Hollywood films that were released in both territories in 2011, 19 grossed more in China than they did in Japan, many by a very wide margin. 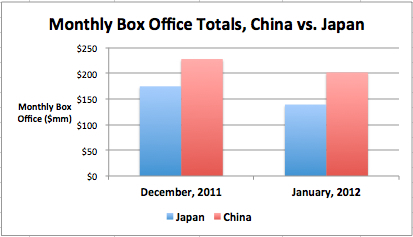 Transformers 3 and Kung Fu Panda 2, for example, each grossed 3 times as much in China as they did in Japan. Had China allowed more American films into its theaters last year, it would have undoubtedly surpassed Japan in total box office in 2011. 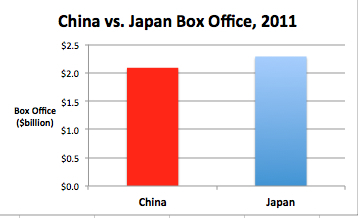 China also offers better upside for its domestic films than Japan does for its films. The top grossing Chinese films of the past year—The Flowers of War, Flying Swords of Dragon Gate, Let the Bullets Fly and Aftershock—have all earned more than $85 million in their domestic Chinese releases. During the same period, not one Japanese-made film cracked even $60 million in Japan. The implications of China’s rapid ascension are enormous for the global entertainment business. As China’s theatrical business grows, so will its television and home video industries. In the coming years China’s global share of the entertainment pie will expand from the low single digits to 20 percent and higher, and China’s buyers will rapidly gain clout in deciding which films get made, and how and where they are produced. The flows of capital for production and marketing of movies will increasingly come from China. By simple attrition, U.S. tastes will become less dominant, and Chinese tastes will become more influential. Hollywood’s major studios have been extraordinarily slow to respond to China’s emergence. It is no longer reasonable for them to expect that China will play by their rules, or that Hollywood will remain the world entertainment industry’s center of gravity for much longer. Any of us who hope to enjoy career longevity in the global film business had better start thinking and acting more with China firmly in mind. This entry was posted in Analysis, Box Office Reports, General News, Opinion and tagged China's box office, China's box office share, Chinese box office, Flying Swords of Dragon Gate, global film industry, Japan's box office, Kung Fu Panda 2, Rob Cain, Robert Cain, The Flowers of War, Transformers 3 by chinafilmbiz. Bookmark the permalink.